The United States Air Force (USAF) has always considered space as a logical extension of the air space in which it had its operations and the X-37B automatic space plane is the latest expression of this belief. Earlier, the USAF conducted programs such as Project Bomi and Dyna Soar (X-20) while the Space Shuttle was, to a certain extent, a fulfillment of the USAFs wish to have ready access to space. 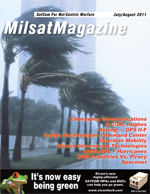 These developments have been discussed in some detail in the authors article Military Access To Space (MilsatMagazine, May 2009). As a long term replacement for the Space Shuttle as well as an effort to enhance space access capabilities in general, NASA looked at the National Aero Space Plane (NASP), also known as X-30, which was to provide a single stage to orbit capability. It was envisaged to build two aircraft by the mid 90s and possible contractors included General Dynamics, McDonnell Douglas, and Rockwell, with Rocketdyne and Pratt & Whitney as engine contractors. The program was cancelled in 1993. There is little doubt the USAF had a significant interest in this development and, if it had proceeded, we could have expected military applications. In a similar way, we can presume that the USAF was keeping its eye on the abortive Lockheed Martin X-33 and Orbital X-34 space plane developments that NASA undertook in the late 1990s. In the case of the X-33, delays in the program as well as escalating costs led to its cancellation in March of 2001 when the vehicle was 85 percent complete, although sub-scale models had been flown. In the X-34 program, which was to be a light space plane, the X-34A was a sub-orbital test vehicle and the X-34B an orbital test vehicle. Two X-34A vehicles were built. The first, designated A1, was initially a hybrid of flight hardware and structural test hardware and was used, in this configuration, to certify the use of the Tristar aircraft as a launch vehicle. The first flight in this configuration took place on 29 June 1999. A2 was the first actual flight article whilst the designation A3 was given to the A1 vehicle after the installation of the remaining flight hardware. In the first year NASA hoped to conduct 27 flights from White Sands and Edwards but the program was cancelled in March 2001 because of excessive costs. In 1996, NASA started the X-37A program for an advanced technology flight demonstrator which would provide data in the definition of future space transportation. The vehicle would have tested and validated these technologies in the environment of space as well as test the performance of the vehicle during orbital flight, re-entry and landing. The design had an experiment bay that could carry various instruments. NASA had approximately 41 technologies that could have been demonstrated by the X-37A. In 1999, NASA contracted with Boeing Integrated Defense Systems to design and develop the vehicle, which was built by the California branch of Boeings Phantom Works  the first of two orbital flights was expected in 2003 after having been launched on board of a Space Shuttle flight. However, by 2001, the USAF withdrew its support for the project and this led to funding delays. Nevertheless, in 2002, NASA amended the contract to two instead of only one vehicle. One was to be used for atmospheric drop tests (labelled Approach and Landing Test Vehicle, ALTV) and one vehicle for orbital tests. By then, the atmospheric tests were scheduled for late 2004, with the first orbital flight, using an expendable booster, was planned for 2006. However, in late 2003, NASA told Boeing to reduce workload on the orbital vehicle  still later, the program was completely placed on hold. In early 2004, NASA stated the X-37 could no longer play a role in the agencys long term agenda, and on September 13, 2004, the X-37A program was transferred from NASA to the Defense Advanced Research Projects Agency (DARPA) and became a classified project as part of the independent space policy, which the Department of Defense has pursued since the Challenger disaster. Under the DARPA banner, the X-37A made three captive flights (on September 2, 2004, June 21, 2005, and March 24, 2006) with the Scaled Composites White Knight vehicle before making the first Approach and Landing Test on April 7, 2006, when it was released at an altitude of 11.3 km to glide back to Edwards AFB in California. During the landing, the X-37A rolled off the runway, damaging the nose wheel. A second flight occurred on August 18, 2006, and the third and final one occurred on September 26, 2006. The X-37A had a span of 27-feet, 6-inches, and a length of 15-feet, allowing it to fit inside the Space Shuttles payload bay. On orbit propulsion was to be provided by a Rocketdyne AR-2/3 rocket engine, fuelled by JP-8 jet fuel and hydrogen peroxide. The SMV was intended to be an unmanned, re-usable spacecraft that could be launched on the Space Shuttle or an expendable booster, spend up to a year in orbit, and then return to Earth to land on a runway just like an aircraft. The tasks foreseen by the SMV were to deliver small payloads to orbit and then undertake remote examination of satellites and orbital reconnaissance. The technology demonstrator, also named Integrated Technology Test Bed (ITTB) was designated as X-40A and was a 90 percent scale unpowered version of the SMV vehicle. The vehicle had a span of 11-feet, 6-inches and a length of 22-feet. The first flight of the X-40A was on August 11, 1998, when it was released from a UH-60 helicopter over Holloman AFB. The X-40B designation referred to full scale SMV and would have been fitted with tricycle landing gear and a reusable rocket motor, advanced thermal protection systems, avionics and flight control systems. In 2000 the X-40A was transferred to NASA for tests as part of the X-37 development. The tests comprised seven drop flights from a CH-47 over Edwards AFB. The X-40B program was terminated and, it is assumed, was merged with the X-37B program. The X-37B program is based on the X-37A and the X-40A programs and comprises an unmanned space vehicle capable of remaining in space for as long as 21 days before gliding to an autonomous re-entry and landing at the end of its flight, most likely at a lengthy runway modified for the space shuttle at Vandenberg Air Force Base. Designed by Boeing and funded by the USAF, it will provide the US military with a testing platform for new space technologies. The X-37B incorporates a number of untested technologies, including new thermal protection tiles underneath and high-temperature components and seals. The spacecraft, also named the Orbital Test Vehicle, has a wing span of 1411 and a length of 29. It is powered by a Rocketdyne AR-2/3, which is fuelled by hydrogen peroxide and JP-8. The X-37B will serve as a maneuverable test platform for satellites and other space technologies and will be capable to expose satellite sensors, subsystems, components and associated technology to the space environment by opening the doors of its small payload bay. One of the advantages for scientists and engineers is that the OTV returns to Earth and the tested components can be inspected, making the development of better components an easier task. The first two flights of the X-37B OTV, which are scheduled for April 2010 and 2011 using an Atlas V-501, will more than likely be used to make sure the spacecraft is working in the way it was planned and designed, after which the USAF is expected to commence a program of operational test flights. No details of such an operational program have, as of yet, been published. Remember that the letter X in the designation X-37B indicates experimental. This means it is unlikely that the X-37B vehicle will be put into mass production. Neither does it mean a future operational vehicle would resemble the X-37B except in a very broad manner. The vehicle will, however, provide the USAF with a basis for developing future operational systems which will be capable of protecting and replacing space assets, the inspection of objects in space, and to also deliver munitions into space, meaning, in simple and unbiased terms, a flexible space based weapons system. Such a system should, however, be complemented by a rapid launch capability. The current absence of such a capability is to be considered as a limitation to the full scale development of an operational derivative of the X-37B. It is interesting to draw parallels between the Dyna Soar (X-20) of the early sixties and X-37B programs. Both vehicles seem to have the same basic mission objective: to provide military access to space with a return capability. Where they differ is that the X-20 required a pilot whilst the X-37B does not. This difference is a result of the same developments that we see in other military aircraft, such as UAVs  the aircraft does not require a pilot but is, instead, flown by a controller who sits in the comfortable environment of an operations room, far away from the potentially hazardous environment in which the aircraft operates, that being the theatre of war. Jos Heyman is the Managing Director of Tiros Space Information, a consultancy specializing in information on the scientific exploration and commercial application of space and he is the editor of the TSI News Bulletin. United Launch Alliance successfully launched the U.S. military�s X-37B, a prototype space plane also called the Orbital Test Vehicle (OTV), from the Space Launch Complex-41 at Cape Canaveral Air Force Station, Florida. The Atlas V will fly in the 501 vehicle configuration with a five meter fairing, no solid rocket boosters and a single-engine Centaru upper stage. X-37B OTV-1 (Orbital Test Vehicle 1) is an American unmanned spacecraft, in what is the maiden flight of the Boeing X-37B. It was originally scheduled for launch in the payload bay of a Space Shuttle, however following the Columbia accident, it was transferred to a Delta II 7920. It was subsequently transferred to the Atlas V following concerns over the spacecraft�s aerodynamic properties during launch. This is the 21st Atlas V launch in program history. This space mission has much secrecy associated with it, including the unpiloted military space plane. The spacecraft will be placed into low Earth orbit for testing, then it will be de-orbited for landing. While the launch took place in Florida, the landing is to occur on a runway at Vandenberg Air Force Base, California with Edwards Air Force Base as the alternate site. The duration of the mission has not been announced, although an Air Force spokesperson has said the vehicle has a requirement to be on-orbit for up to 270 days. In 1999, NASA selected Boeing Integrated Defense Systems to design and develop the vehicle, which was built by the California branch of Boeing�s Phantom Works. The X-37B space plane prototype is seen on a runway during flight tests in this undated photo released by the U.S. Air Force. Credit: USAF. The X-37 was transferred from NASA to the Defense Advanced Research Projects Agency on September 13, 2004. The program has become a classified project, though it is not known whether DARPA will maintain this status for the project. NASA�s spaceflight program may be centered around the Crew Exploration Vehicle, while DARPA will promote the X-37 as part of the independent space policy which the Department of Defense has pursued since the Challenger disaster. This vehicle has the potential to become United States� first operational military spaceplane, after the cancellation of Dyna-Soar in 1963. It is expected to operate in a velocity range of up to Mach 25.